Formulation: Lady’s mantle, borage, buckwheat and mullein combine to calm and fortify. Quince seed extract and witch hazel help the skin retain moisture, while nourishing shea butter joins macadamia nut and coconut oils to provide protection. Anthyllis soothes and balances. I have rosacea and tend toward redness and bumpy patches on my face. 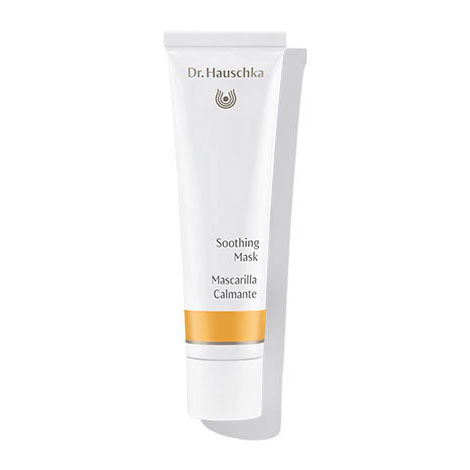 The Soothing Mask truly helps to reduce the redness and manage the condition. Highly recommend. This is my go-to mask whenever an irritation occurs on my face. I bought this for a recent vacation and it was wonderful to refresh and soothe my skin after the beach. I recently tried this mask at a friend's house and it was so nice to put on after using the cleansing cream which can make my skin dry out in the winter. 10 minutes with this mask on afterward and my skin was smooth soft and supple with no dry areas. 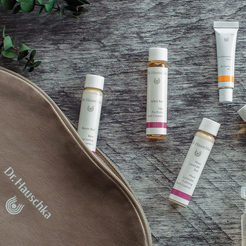 Just to reset and refresh I love using this mask, as I do all the Dr. Hauschka masks! No burning skin/eyes/anything. No rashes. My rosacea is tamed down. My skin feels soft and moist. Unbelievable. This is a keeper. The mask is great. I don't have sensitive skin in general, but sometimes my cheeks become dry and itchy, even burning in the wintertime. That is when I use Soothing Mask. It helps my skin to bounce back from severe dryness and gets rid of itchy and burning skin. It also calms me with its super relaxing scent. This product truly helps with soothing sensitive skin! I have very sensitive skin that reacts to changes in temperature. I use the soothing mask whenever my skin starts to react to the changes. After I remove the mask, my skin is fresh and glowing again. Sometimes I use it at night for 10 minutes before I start my night care routine. My skin was on fire after spending the afternoon tromping around with my favorite kid, my dog, and hers. Boy did we have fun! The wind was constant and the wet snow was intermittent, and my face got really chapped. I warmed my face with a wet towel and slathered this beauty on, and left it overnight (as I do all Hauschka masks, ahem). My skin wasn't even sensitive when I woke up. No red, chapped, stingy face, instead, I felt "healed" for lack of a better word. After cleansing and toning, apply a generous amount of Soothing Mask to the face (include eye area), neck and décolleté. For greater product benefits, apply while skin is still moist from toner. Remove after 20 minutes with a warm, damp cloth. We recommend using Soothing Mask once to twice a week. For skin that is particularly reactive, mix a small amount of Soothing Mask with your regular day cream. For cleansing, we recommend Cleansing Cream or Soothing Cleansing Milk. For toning, Sensitive Care Conditioner or Facial Toner is recommended. In the case of extremely sensitive, red, irritated skin, apply Soothing Mask in a thin layer under your moisturizer daily for 4-6 weeks.